How nice, after a day spent panning for gold, horseback riding, or wading in creeks, to settle into a hot tub. We all know that sound "Ahhh! ", as we feel the chill and wear-and-tear release us and float away. 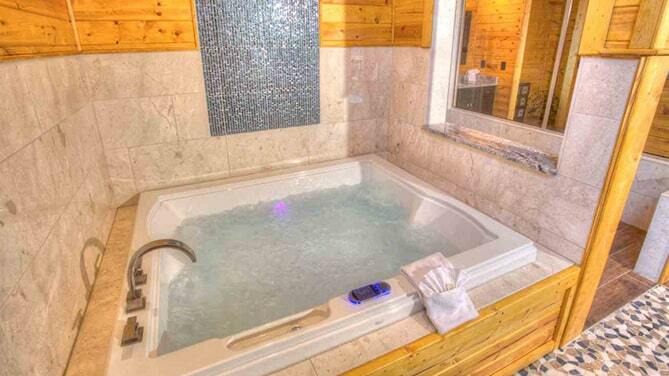 Hot tubs are considered romantic, healing or luxurious, and are welcomed features in our vacation cabins. But every bit of heaven comes with some restrictions, and it's wise to be realistic about hot tub safety and cleanliness. You want to pamper your body not stress it, and by observing some safety pointers, you will be able to get maximum comfort and healthful benefit from your soak. 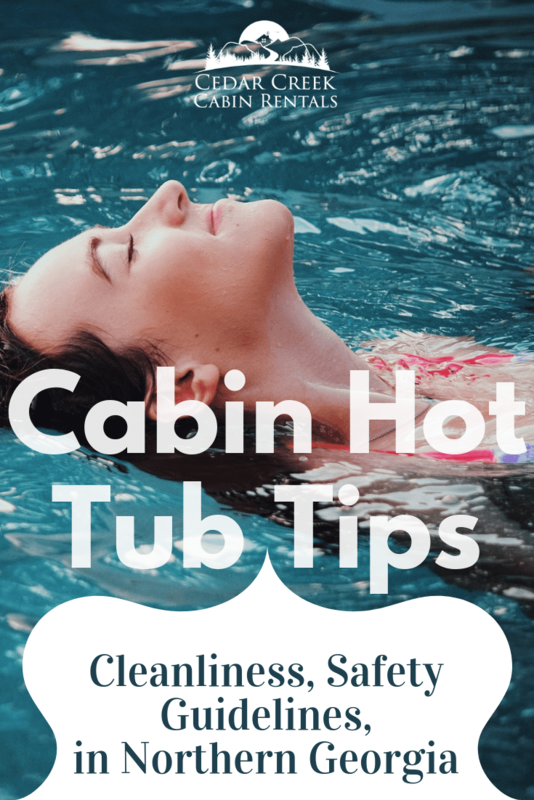 The following blog will not only explore safety and benefit, but also the benefits of hot tubs and a list of activities for when you need a break from the hot bubbling waters. Throughout history, hot water has been used as a therapeutic and healing device. History shows that as early as 2,000 B.C., ancient Egyptians placed sizzling hot stones into bath water as a means of easing pain and invoking relaxation. 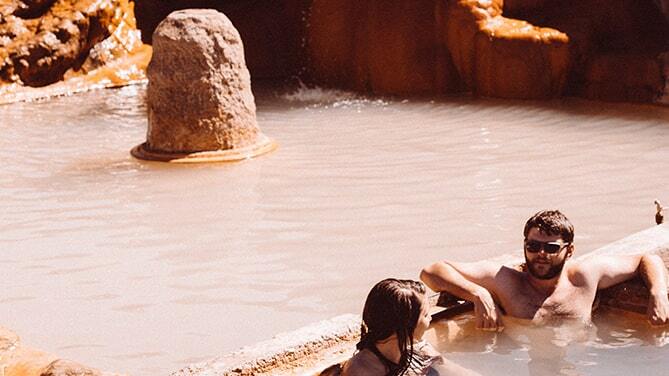 At the same time, Ancient Greeks built structures around natural hot springs which served as early hospitals. And this simplistic yet powerful form of healing is still strongly recommended by medical professionals today. In addition, most doctors and physical therapist recommend hot water therapy for easing strained or pulled muscles, muscle spasms, and injuries. This is because hot water stimulates the release of endorphins, which reduces pain while improving your mood. 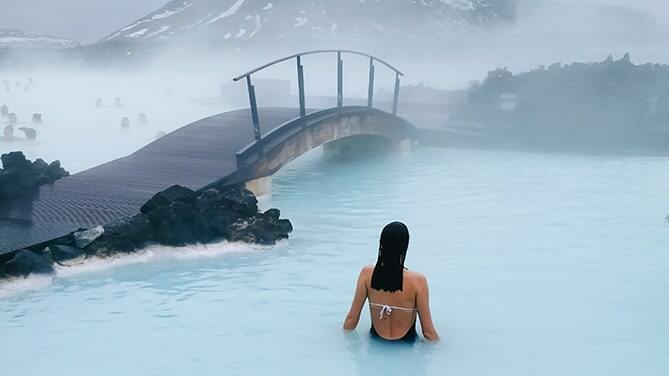 On top of this, hot tubs will also stimulate improved blood flow, which allows oxygen and nutrients to remove pain-causing lactic acid in a way that is faster and more effective. Lastly, heated water can also contribute to lower blood pressure, according to the research of Mayo Clinic researcher, Thomas G. Allison. With all of these incredible health benefits, why wouldn't you choose to stay in one of these hot tub equipped cabins? You can start and end each day by healing your body and relieving and aches and pains that you may have. If you book a rental with a hot tub on an outdoor porch, you can also enjoy the power of fresh, mountain air and the positive energy and rejuvenation that it will bring to you. Combine that with the beautiful scenery that will inspire awe and joy in your spirit, and you'll find that you'll feel healthier and happier from the inside out. Vacationing in a cabin with a hot tub will also help to lower your stress levels and bring forth a sense to total relaxation. Numerous studies have show that immersing yourself in warm water can reduce the hormones that are associated with stress, while simultaneously separating you from your stress sources and triggers. In this way, any anxiety that you may be experiencing will be further decreased. Other researchers have discovered that after 25 minutes of soaking in water at about 102 degrees Fahrenheit, your autonomic nervous system is altered, which produces changes that stimulate relaxation. Hot tubs can also enable you to catch some more Z's. If you struggle with insomnia or find yourself tossing and turning for quite a while before falling asleep, hot water can help. The National Sleep Foundation purports that soaking in a hot tub before bedtime will prompt relaxation and will increase your body temperature, both of which will help you to fall asleep faster and sleep more soundly. This means that you can wake up each day feeling totally rested and relaxed, enabling you to enjoy all of the fun things that there are to do and see in the Helen area. 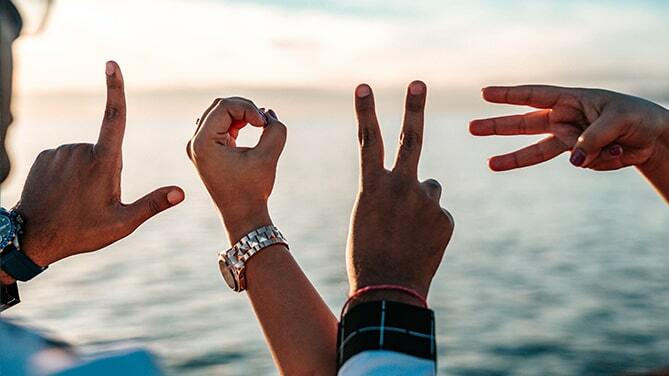 If you are looking to reconnect with your loved ones, or re-light the flames of romance with that special someone, there's no better place to visit than the cabins in Helen. As discussed previously, a nice soak in hot water can release endorphins, which put you in a better, happier, more relaxed mood. Under these conditions, you will find it much easier to open up to your sweetheart or your family and become more bonded. Sharing a glass of wine in your hot tub, as you look out over the gorgeous northern Georgia mountains will enable you to create powerful memories that will last for a lifetime. The hot tub will also help you to feel more relaxed and rested, even when you're not soaking. This allows you and your group to have more fun as you visit northern Georgia's many attractions together. And because hot tubs have long been known for their ability to produce a feeling of sensuality, it's easy to get into a romantic mood on a couple's getaway. Our cabins are truly perfect for everyone. Many hotel properties offer guests a hot tub for relaxation and enjoyment but are unable to provide the privacy of a rental cabin. 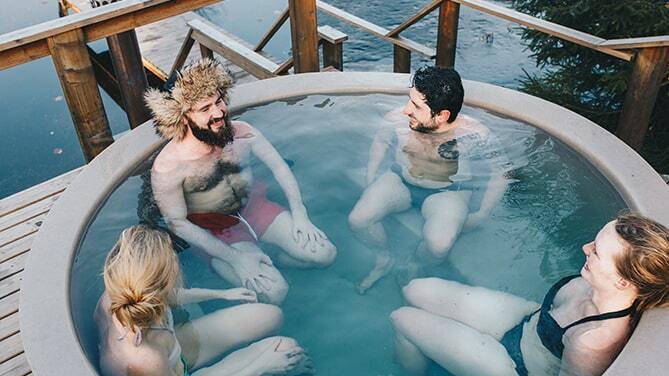 Imagine heading to the hotel hot tub to relax and then be joined by other guests. You may not be able to continue your conversation or their behavior may force you to leave. Enjoying the private hot tub in a rental cabin ensures you can be alone, uninterrupted with your sweetie, or together as a family without being disturbed by strangers. Having an on-site hot tub feels much more like relaxing at home than using a hot tub in a hotel. 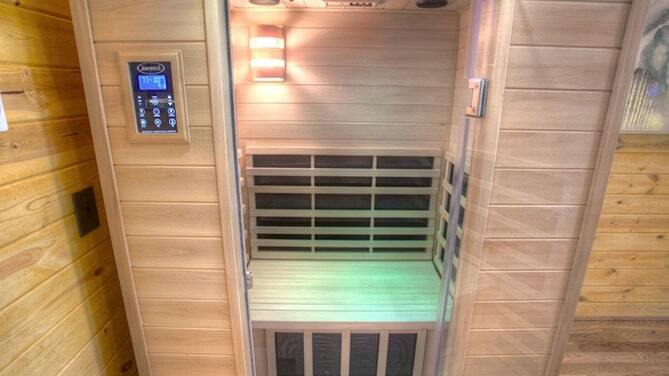 You won't have to wrap in a towel or use a robe on your way to the hot tub. 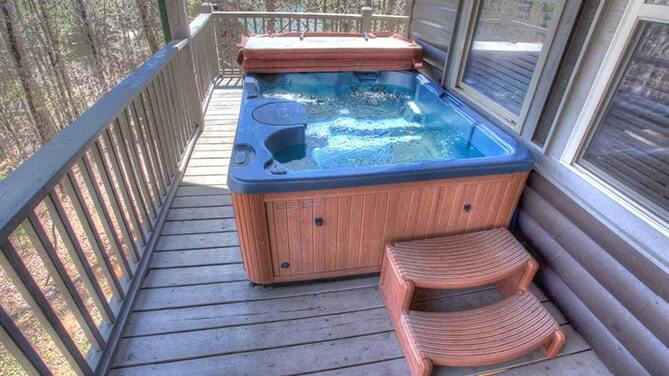 Its convenient location allows you to step right out of the cabin's living space into the hot tub. You can come and go as you please and don't need to worry about being in other people's space or misplacing your personal items. The space is yours to do with as you please. Many hotels limit the use of a hot tub to certain hours. 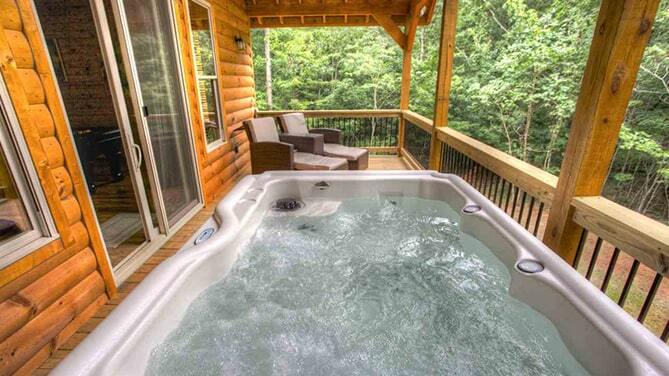 Having an on-site hot tub in your rental cabin allows you ultimate relaxation whenever you choose. You can start your day with a relaxing soak, enjoy the hot tub while others are fixing a meal, or end the day with a nightcap visit to the hot tub. Since it is completely private it is up to you when you will enjoy the relaxation. Ahhhhh!... The joys of cabin-ing in the North Georgia mountains. Kick back in your hot tub and take in the cool mountain air; the incredible mountain range views; and the hydrotherapy of a soothing warm hot tub. Then step inside and why not enjoy your Jacuzzi that awaits. After all, you deserve every bit of it, right? NOT SO FAST!!! What the heck is in that tub anyway? Or should I say who was in it last and what did they have? Who, with what, and when was it last cleaned? There are things that grow in these nice warm waters that can be extremely detrimental to your health. 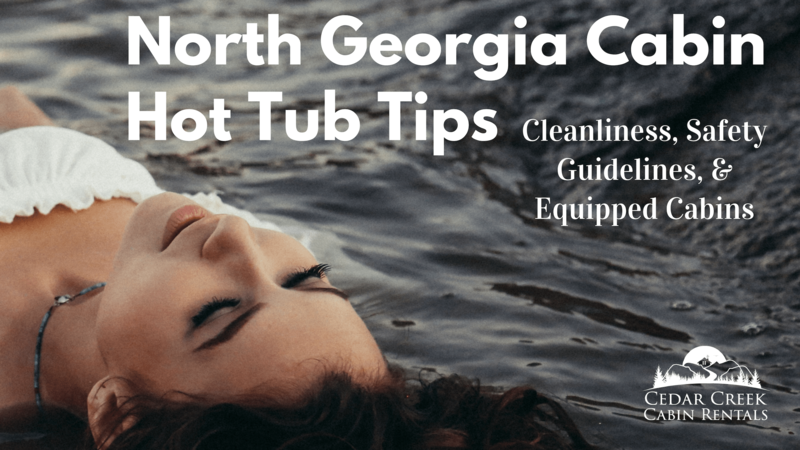 To clean the hot tub, a total refresh of water, flush the jets with some bleach to sterilize, then add bromine tabs to keep the water sterile and finally, rinse and clean the filter often to keep the hot tub water clean. Many North Georgia cabin rentals do not know the basics and just dump a bunch of chemicals, but what is that doing to you? If you arrive and look in the water and it is not crystal clear, call and have it refreshed. Obviously, it will cloud after you get in it with soap, dirt, and spill your glass of wine in it. Take a shower before you get in and keep it clean. I know, you're on vacation and that's a pain to always do but it will keep the hot tub water clean. Some safety rules are pretty common sense, like don't use glass containers around the tub, as there is always the danger of breakage. Use care getting in and out of the tub. Keep electrical devices away from the tub, as it takes just a moment for your radio, for instance, to fall into the water and "warm you up" in a really bad way. 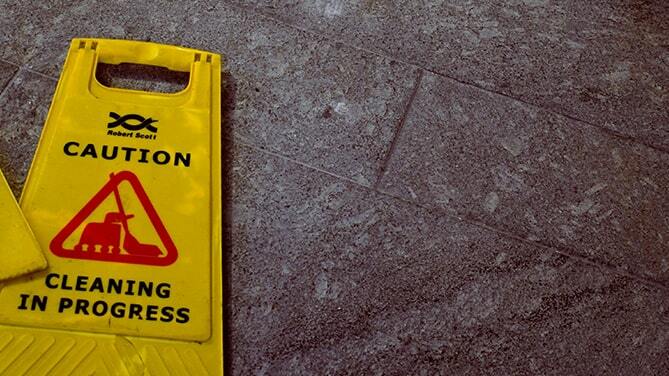 But other safety tips are related to physiological truths about the human body and what is and isn't good for it. The body is not designed to take heat above 102 degrees or so especially heat that it can't disperse through sweating and evaporation. 104 degrees is considered the maximum adults should enjoy in a hot tub, and that only for 15 minutes. So, using a hot tub thermometer or keeping an eye on the settings and clock is definitely a good idea. Those are the basic recommendations for healthy adults. But there are also other factors that may reduce a person's tolerance for heat. For instance, both drugs and alcohol can affect you and require extra caution. It's a good idea to speak to your physician or pharmacist about using hot tubs while on certain prescription drugs. While a pregnant woman may be comfortable in the tub, her unborn baby is much more sensitive. Most doctors suggest pregnant women not use hot tubs at all, and certainly not any hotter than 100 degrees. Children are vulnerable in a couple ways so you should lower the heat for them, haul them out after 10 minutes, forbid them from putting their heads underwater (hair in drains creates a drowning risk--so don't put your own head under either!) and never, ever leave them unattended, even for a moment. Warning signs that you might be overdoing the heat include heart palpitations, light-headedness, shakiness and a feeling of sudden weakness. In this case, get out and cool your body off. If these guidelines are observed, you can enjoy relaxing in one of the hot tubs, perhaps sipping a cool drink (from a paper or plastic cup!) and feel your tired or chilled body let go with an "Ahhh!" Please be safe and know what you're getting into. 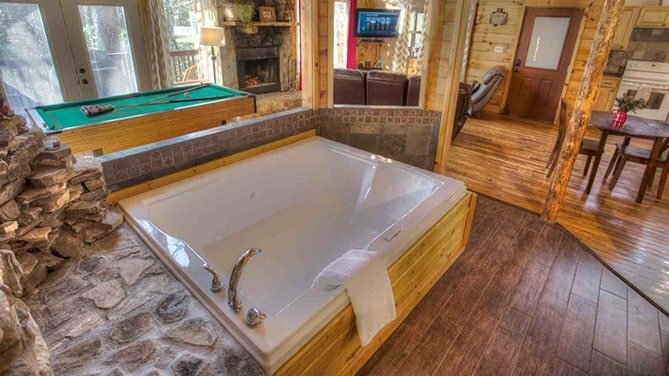 While Cedar Creek's North Georgia cabin rentals have many different cabins with different amenities and views, hot tubs are a must at all of our cabins. So, if you’re looking for luxury, privacy, and natural settings with a hot tub, cabins at Cedar Creek will not disappoint. All of our cabins have a hot tub. 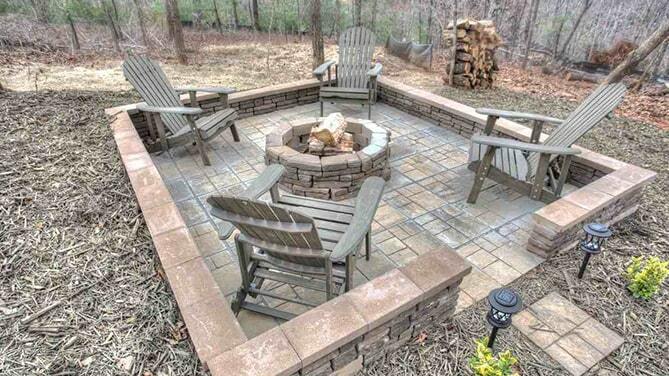 Envision sitting in a relaxing hot tub on the back deck of the cabin with beautiful scenery all around, such as a bubbling creek and breathtaking views of the mountains to take in while enjoying the hot tub. Life really does not get much better. 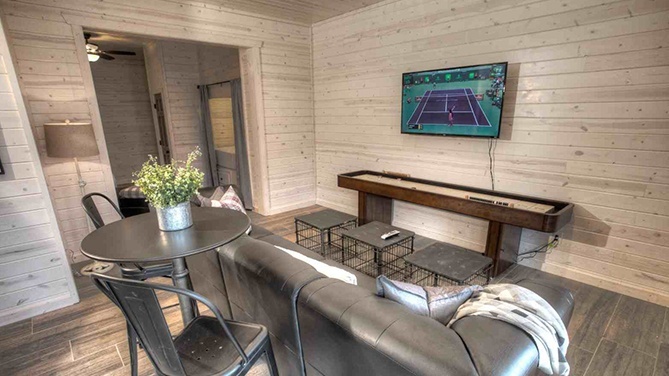 Of course, our cabins in Helen, GA with hot tubs are great but have no fear; there are many other fabulous amenities in the cabins, such as bathrooms with Jacuzzi bathtubs, pool tables, fireplaces, high-speed internet, granite countertops in full kitchens and satellite television. Some cabins also have a washer dryer, a charcoal BBQ, microwave, CD stereo, outdoor bar, fire pit, and a coffee maker. After experiencing luxury cabins with hot tubs and other amenities, the place may feel just like home. Like all new homes, however, you are likely to get the urge to explore. That's no problem at Cedar Creek Cabins Rentals. 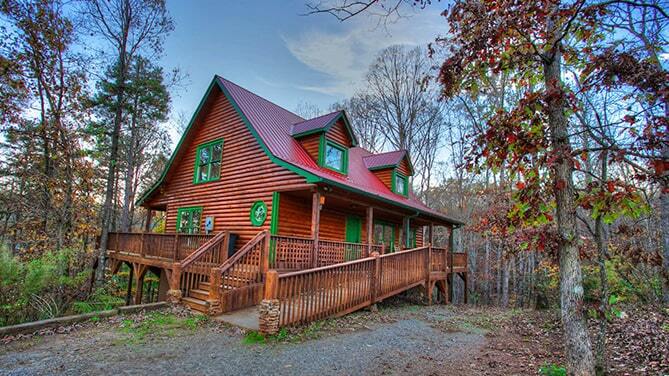 Because of where our cabins are located, adventure and excitement are situated close by in and around the Alpine village of Helen, Georgia. 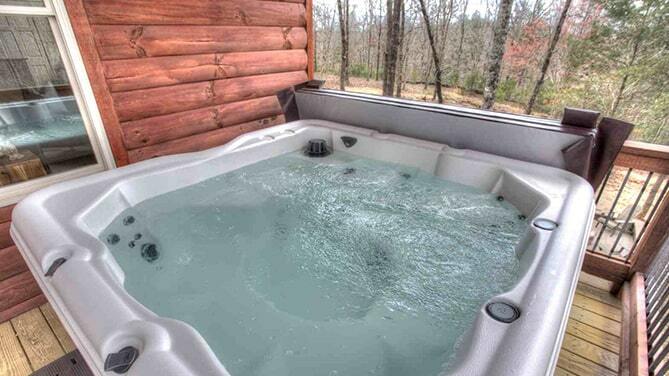 Click here to view all of our hot tub equipped cabins. Our hot tubs are close to all the action near Helen, Georgia. Many of our guests spend their days in the North Georgia mountains hiking, biking, zip lining, or paddling. Here are several common options for our guests. Fishing - There are many activities to enjoy near the luxury cabins. For example, you can try your hand at catching trout in nearby Duke’s Creek and the Chattahoochee River. Alternatively, go to Unicoi State Park and catch largemouth bass and trout. These are some of the best fishing spots in Georgia, so get out there and experience fishing in North Georgia. State Parks - Georgia has some of the most amazing forests and state parks in America and these parks are located close to the Cedar Creek Cabin Rentals. Go for a hike or stroll at Unicoi State Park, where visitors can swim in Smith Lake, walk up to Anna Ruby Falls, choose between long or short hikes. Do not forget to bring water and maybe a yummy picnic to enjoy. Another nearby destination is Smithgall Woods State Park, which has over 20 trails for biking and hiking, guided tours, “catch and release” trout fishing, and some of the best picnic areas around. Generally, seeing bears is something to be wary of but not at Black Forest Bear Park, where visitors can actually visit the bears in their environment and feed them for a small fee. For those who enjoy reptiles, a snake exhibit that includes tarantulas, snakes, and other animals is also a fun place to go. Appalachian Trail - Do not forget the Appalachian Trail, which passes through the Chattahoochee-Oconee National Forest for almost 80 miles, reachable on foot from the Amicalola Falls State Park. Be ready to hike, though, as the access trail is almost 9 miles long before reaching the Trail and then, of course, miles and miles of hiking on the famous trail is available. Enjoy a day hike or bring gear for an overnight camping experience before heading back to your cabin hot tub. Rafting - If the Chattooga River looks familiar, that is because the river is famous for its inclusion in major movies. The reason why is much of this river is an expert-only region for rafters but if something calmer sounds better, try the Chattahoochee River, which is calm for most of the river and is a great place for beginning and moderate-level rafters to enjoy. Some easier rides include Soque River and Tiger Creek. Tubing - Some people may like the rush of speeding down the Georgia Rivers in a raft but others might like something a little more leisurely and if this is the case, Helen, Georgia tubing is the answer. Take a tubing expedition down the Chattahoochee River for two hours or more and enjoy the beautiful scenery passing by. Shopping and Dining - Of course, enjoying a dinner out and doing a little local shopping is part of any vacation. Enjoy the lovely town of Helen, located only ten minutes from the cabins, where you can find a variety of delicious restaurants, galleries, museums, and stores. When thinking about a luxury vacation, a relaxing hot tub is usually part of the vision, right? Not to mention a cabin with plenty of other luxurious touches and privacy, stunning views, many fun, exciting activities to try nearby, delicious restaurants and great shopping. No wonder the Cedar Creek Cabins should be at the top of the list. 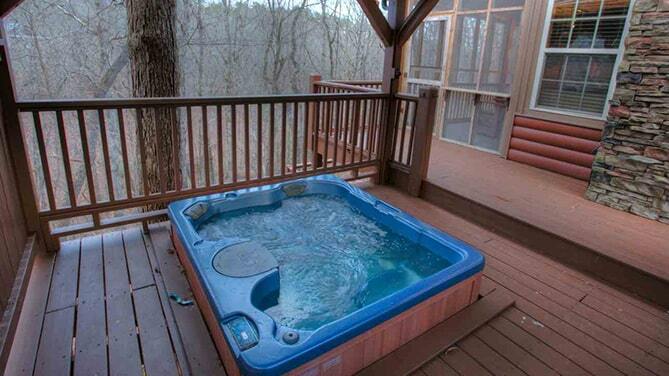 Have you rented one of our cabins with hot tubs before? What did you enjoy most about the cabin?